5/2/2008 ~ It's Never Too Late to Learn How to Play the Guitar! We buy guitars every day... but this week one purchase gave me a warm, fuzzy feeling. On Monday a lady walked into the store with a Yamaha acoustic and told us that her late mother bought it from us five years ago. She said her mother decided to learn to play guitar when she turned 80 years old! On her 80th birthday she came to Pittsburgh Guitars, bought a guitar, and we arranged for one of our teachers to visit her home for lessons. Her daughter told us that her mother was very excited about her guitar. She remembered times when she would be talking to her mother on the phone and her mother would suddenly say, "Oh! I have to hang up now, my guitar teacher is here!!" Eventually her mother learned to play a few songs, and the entire family loved it when she played "Happy Birthday" at one of the grandkids' parties. It was heartwarming to hear the stories. Unfortunately, late in her 82nd year, her mother passed away. The daughter kept the guitar for a few years, but this week she decided to sell it back to us, so it could be passed on to another new student. She said it brought her mother a lot of happiness in her final years. Her mother never became a great guitarist, but she did what she set out to do: learn to play! And she loved it! Here's a picture of John with her Yamaha. There are two messages here: (1) It's never too late to start a new hobby, especially if it's playing guitar! and (2) You don't have to play like a superstar to enjoy it. Oh, and (3) imagine how cool it would be to have your grandmother show up at your party with a guitar! We should all hope to be a person that interesting when we get old! Here's what John will look like when HE'S 80. Here at the Pittsburgh Guitars International Institute Of Guitar Instruction we have students from all age groups. (Some almost as old as Scott!) (He was at the original Woodstock, you know!) Some of our students have been playing for many years and want to learn a few new tricks. Some of our students are complete beginners. All of them seem to be having a great time. This year it's interesting that we have more young students than ever before. And it's good to see young folks taking up the guitar. Maybe the "Guitar Hero" video game has inspired them... Or maybe they've seen their parents' guitars lying around the house. (No doubt purchased at Pittsburgh Guitars!).... Or maybe it's that despite pitch-corrected vocals, sampled drum loops, and computer-triggered-self-playing-keyboards, there is still a need for actual guitarists in contemporary songs! Here's a new player, Richard, who bought a guitar on Wednesday to celebrate his 21st birthday! And we now have our first Father and Son student team. Here are Joshua and Gerald. During May, our Anniversary month, we're having a Guitar Lesson Special: Sign up for at least four one hour guitar lessons and get a Free Music Stand, a Free Guitar Tuner and a Free Lesson Book! We've just added a new teacher, Ron Ziai, so we now have three super-mega-excellent instructors. Whether you're starting from scratch, or have already spent years on the road, Ron, Rich Dugan or John Purse can expand your musical horizons! PS: I've been thinking about my earlier comment... Naturally the guitar is vital to rock, blues and country music... but I believe that ALL music would benefit from the addition of a guitar. I bet that even the early classical composers, like Beethoven, would have used a guitar in their arrangements if the guitarists of their era had had the technology to be heard amongst the other orchestral instruments. Think about the versatility and expressiveness of the guitar: Other stringed instruments, like violins for example, can be very passionate, but they can't match the flexibility of the guitar with its multi-string chords. Keyboards can go from a sharp attack to sustained notes, but they don't have the personal, hands-on-the-strings connection of a guitar. And trumpets can be loud and powerful, but not compared to a guitar through a Marshall stack. I know I don't have to sell YOU, oh Reader of the Pittsburgh Guitars Email Special, on the merits of our favorite instrument. But I think that every so often we take the guitar for granted. I just wanted to take a minute to appreciate it for the special instrument it is. Yesterday I got an email from our second favorite customer. (Our first favorite is YOU, of course!) He asked if I could identify a guitar in a youtube video. Anyway, the video in question this week was of a band called The Music Machine, doing their super-cool hit "Talk Talk." It's one minute and fifty-six seconds of pure 1966 punk-rock. The lead singer was playing an easy to recognize Guild Starfire IV, and the bass player was using an Italian-made EKO violin-shaped bass. 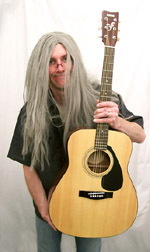 And sure enough, the lead guitarist was using an unusual guitar... But I knew what it was immediately! A Martin GT-75. First we must put on our "look-back" goggles and visit the late 1950's... Gibson and Fender had been successfully marketing solid-body electric guitars for nearly a decade, and rock and roll was proving to be more than just a passing fad. Music was becoming electrified, literally and figuratively. As a 125-year-old acoustic-guitar-only company, Martin wasn't quick to jump on any bandwagon, but by 1958 they figured they'd better get in the game with something electric. This, of course, was long before the development of the miniaturized Fishman pickups that Martin and other companies use today... so Martin opted to screw large pickups right to the face of their acoustic guitars. In 1959 they introduced three models, the 00-18E, the D-18E, and the D-28E. All three were stock acoustic guitars with DeArmond pickups mounted to their top. As you might imagine, the heavy pickups, knobs and switches had a serious negative effect on the acoustic sound of these instruments. And they didn't go over well. The D-18E lasted for one year, and the 00-18E and D-28E struggled through to 1964. The least successful of these unsuccessful instruments was the most expensive one, the gold-hardware D-28E. In 1959 Martin manufactured 176 D-28Es, but only 62 more were made over the next four years. Here's a picture of John with two of them (.84% of the entire run!)... one from the first year and one from the last. Realizing that they couldn't just modify their standard models, Martin decided to create an entirely new electric guitar. They saw the success that Gibson was having with their recently introduced ES-335 line, so they decided to make a similar thin-body electric. Except they couldn't make up their mind if it should have the new style double-cutaway look of the 335, or if it should feature a more classic single-cutaway design. Their solution: make both! After a handful of prototypes in 1961, Martin officially introduced the new models in 1962. They were the single-cutaway one-pickup F-50; the single-cutaway two-pickup F-55; and the double-cutaway two-pickup F-65. Here's John with two F-55s. (Yeah, I don't know why I have TWO of those either...) The F-50 looked like this. And the F-65 looked like this. Now, I bet you're thinking, "Wow, a historic, well-respected company like Martin introducing quality hand-made electric instruments? They must have been a great success!" Well... er... no, they weren't. After the initial run of guitars in 1962 sales figures fell dramatically. Martin's R&D department rushed back to the drawing board. Was the popularity problem with the DeArmond pickups? The cutaway designs? The sunburst finish? Or perhaps the traditional Martin neck and headstock design? Well, they still had a lot of pickups left from the non-selling electric guitars so far... And they didn't have any better ideas on the body shapes... So, color and neck changes were ordered!! In 1965, as they were selling off the last of the "F" series, Martin introduced the two new models: the single cutaway GT-70 and the double cutaway GT-75. These guitars came in black, burgundy or red, and featured a new, larger, pointy headstock. NOW they would have a hit on their hands!!! Except that... no, they didn't. The GT-70 lasted for two years. The GT-75 made it to three. By 1967 Martin had had enough and decided to get out of the electric guitar business forever. Despite their lack of commercial success, Martin electrics did show up on-stage occasionally. Here's the youtube clip of The Music Machine with their GT-75. Here's a picture of Skip Spence playing a GT-75 with Moby Grape. In 1960 Tony Sheridan, a British singer who was quite successful in Europe, played a D-28E. He met the very young Beatles in Germany and their first recording sessions were as his backup band. Here's a picture of Tony Sheridan with a D-28E and the lads. Thirty-three years later Kurt Cobain used a D-28E during Nirvana's MTV "unplugged" appearance. PS: Saturday, May 17th we'll be celebrating Pittsburgh Guitars 29th Anniversary! Stop in for cookies and one-day-only specials! PPS: I met Tony Sheridan in Liverpool a few years ago. He's a very nice guy. One of the songs he recorded in Germany in 1961 with the Beatles was "My Bonnie." That 45 record, with Tony on lead vocals, led to Brian Epstein hearing about the band, becoming their manager and leading them into history. Tony said he would never have believed he'd still be singing that song over 45 years later! Friday 5/16/08 ~ Our 29th Anniversary! 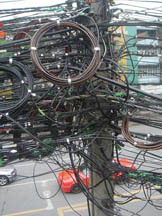 Early in the morning some construction workers accidentally cut into a nearby phone cable. There were 500 phone lines in the cable, and fortunately only 40 were damaged... but one of them was our DSL line. Here at Pittsburgh Guitars we have four phone lines and all of our regular phones worked fine, so it was business as usual with our local customers. But with the DSL line dead, and no internet connection, we were cut off from the rest of the world. It was amazing how odd it felt. We have become so accustomed to instant communication with anyone anywhere, that without it we felt like we were alone, on an island. Since it's our 29th Anniversary weekend I tried to put this internet-less-ness in perspective... after all, we didn't have the internet for the first 16 years of our Pittsburgh Guitars history. But once you know something, you can't go back and un-know it. The internet and email is now so much a part of our daily routine that it's hard to imagine what life was like before it. I know we existed... But how?? We wandered aimlessly that day. Betsy vacuumed the entire second and third floor. I straightened up my desk, and tried to write a letter or two. But even the letters seemed odd... as the computer stared back at me, mockingly... as if to say, "Sure, you can type all you want, but it's not going anywhere..."
Needless to say, we were relieved when things were fixed by Thursday morning. The first thing I did was sell a Rickenbacker to a guy in California; then I exchanged emails with Gregg at Get Hip Records concerning the equipment he'll need for the upcoming Cynics European tour; then I paid my employees' Pennsylvania Quarterly State Withholding Tax (you can ONLY do that on-line these days)... Oh, and then I won a million dollars in an Indonesian lottery! While it's true that I can't fathom how we conducted business before the internet (and even before computers!) I do remember the state of the guitar industry in the late 1970s. As I mentioned a couple of weeks ago, anyone who could attach strings to wood was selling guitars like mad in the late 1960s. But by the mid-1970s many of the Beatle-inspired guitar-buying Baby Boomers had put their instruments aside, and guitar sales fell rapidly. All of the major guitar manufacturers were suffering. Including the world's most famous acoustic guitar maker, Martin. Last week I talked about Martin's early experiments with electric guitars. In the early 1960s business was great. In 1964 they even built a new, larger factory. Their 1965 venture into the electric world was based on a "let's-see-if-we-can-capture-some-of-this-market,-too!" philosophy. But by the late 1970s times were different... and desperate measures were called for. In 1979 they decided to seriously enter the electric field, and this time they would totally break from tradition with their first-ever solid body guitar. For their inspiration they didn't look to Gibson or Fender, who at the time were semi-out-of-date "old school." Instead they noticed the young upstart companies, who were using combinations of fine natural wood. After all, wood was Martin's field of expertise! Two high-profile new companies were Alembic on the West Coast and Kramer on the East Coast. Here are some folks with Alembic instruments. Here are some Kramer guitars. In 1979 Martin introduced three new electric guitars. Well, two-ish actually... (Remember those hollow-body electrics from last week's email? And they couldn't decide if they should make a single-cutaway or double-cutaway? So they made both?) The first two models were the E-18 and the EM-18... and they were nearly identical. The only difference was a mini coil tap switch. Here's a picture of John with a Martin EM-18. The other model was a bass, the EB-18. Here's John with an EB-18. In January 1981 Martin introduced a new, fancier model, the E-28, along with an accompanying bass, the EB-28. The E-28 featured neck-thru-body construction, with a carved top. It was a beautiful guitar. Here's John with a 1981 Martin E-28. Unfortunately, just as with their previous electrics, Martin was not able to find a place in the market. They made a quality guitar, with nice wood and lots of switches... but they couldn't get past their reputation as an acoustic guitar maker. In February 1982 they discontinued all of their electric solid-bodies. So.... Martin's 1979 trip to electric-guitar-land didn't last very long. But apparently Pittsburgh Guitars' 1979 trip to guitar-selling-land has worked out! Tomorrow we're celebrating our 29th Anniversary. I'm not quite sure how it has lasted this long. But if it's any indication, when I decided yesterday to talk about these Martin electrics, I couldn't wait to go through our big pile of cases and find them. It was exciting! Even after 29 years it still gives me a thrill to pick up a guitar. On Monday we'll begin our 30th year of sharing our love of guitars with Pittsburghers... and, thanks to the internet, folks around the world! Thursday 5/22/08 ~ Happy Memorial Day! Thanks for helping us celebrate our 29th Anniversary last weekend. It's been a blast talking about guitars with you these many decades. 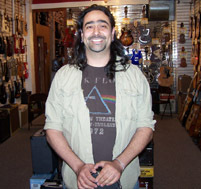 And it always feels nice when someone says they bought their first guitar at Pittsburgh Guitars. Last Saturday one of our Anniversary party customers, Todd, brought in a photo of him holding the Tele copy he bought during our first year in business. So we asked him to pose for an updated version. Here's Todd in 1979 with his band... and in 2008 with his son! And THAT'S why we're in this business! Have a safe and happy Memorial Day Weekend. Stop in on Saturday if you need some strings (or maybe a tambourine!) for your backyard cookout and sing-along. We'll be closed for the holiday on Monday, but first thing Tuesday we'll be ready to start Year #30 at Pittsburgh Guitars!! This week I spent some time at a warehouse over on the North Side. I was hanging with a friend of mine, Gregg Kostelich, who owns and runs Get Hip, Inc. Get Hip is both a record label and a distribution company for other labels. They have customers all over the world and they carry thousands and thousands (and thousands) of records and CDs. Get Hip handles every conceivable musical genre, but Gregg's true love is garage-band rock & roll... and he's toured the globe playing that kind of music with his band, The Cynics. I enjoyed my visit to Get Hip. It was great to see SO MANY records and CDs... and so neatly organized! I always have trouble organizing my records. I've opted for the traditional "alphabetical" approach, but where do you put Elvis, for example? Under "E" between Elastica and Roky Erickson? Or do you put him under "P" between Wilson Picket and Primus?? And what about Weird Al Yankovic? File under "W" or file under "Y"? And what about Eminem? File under "E" or file in the trash? And what about people whose name you might not remember in a hurry? For example, I have a couple of Buffalo Springfield albums, but I also have solo albums by the individual members, Steve Stills, Neil Young, Bruce Palmer and Dewey Martin. Needless to say, Stills and Young are under "S" and "Y," but what about the other two? If I put them under their respective names, I may never find them again... Should I file them next to the Buffalo Springfield albums? But then what about the fifth member of the group, Richie Furay? His next record after the end of Buffalo Springfield was with Poco, and I have them under "P."
And then there's the issue of different styles. For example, I have always filed my country albums in a different section... and I'm not sure why. After all, I have the rock, blues, and soul music intermingled. (Although, I do also separate comedy albums...) (Which makes it doubly hard to file Weird Al...) (Or is that "triply"?) I guess when I first started organizing things, the country twang and the banjo and the pedal steel drew a clear-cut line: these are "country" bands. As opposed to other acts, like Aretha Franklin, Sam & Dave, or The Rolling Stones, which may be slightly different genres, but not enough to subdivide. Do you keep your country on a different shelf? Actually I just watched the Country Music Awards, and Carrie Underwood opened the show with a song that was so far from "country" I don't even think anyone in the band was wearing a cowboy hat. And a couple of nights ago, on another awards show, I saw Rascal Flatts and one of the guys (maybe "Rascal") was playing a Gibson SG Junior! That can't be legal! If these country folk are gonna start using SG Juniors, I may as well file their albums in with everyone else! Hey, speaking of the guitar you SHOULD have in your country band, this week's email special is a super package deal on Fender Squier Telecasters. This week only, if you buy a new Fender Squier Affinity Tele, you'll also get a Free Fender Gig Bag (List price: $39.95), and Free Sabine Nextune Chromatic Guitar Tuner (List price: $34.95) and a Free Ernie Ball Guitar Strap. (List price: $6.50) (Here's a picture of John with the package deal.) So... buy a guitar and get lots of Free stuff! PS: Gregg at Get Hip says that sales of actual vinyl LPs are higher than they have been in years, especially with younger buyers. If you think about it, it's easy to see why. Over the last decade the mini-covers of CDs have removed much of the tangible magic of buying music. And now that downloading has taken off, most music only exists in its audible form (and in some digital 0s and 1s, that you can't see or feel). It's an exciting change of pace to buy an album and get a giant cardboard cover, covered with art and pictures and information. With a vinyl LP you have a physical connection with the artist and their music. PPS: Also LP covers can feature some fine guitar photos. Like this. Or this. Or this! PPPS: Here's The Cynics myspace page. PPPPS: Seventeen years ago they appeared on "BONOGRAPH... Sonny Gets His Share," an album I produced for my label, Bogus Records. 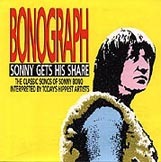 "BONOGRAPH..." is a tribute to Sonny Bono, featuring 16 bands from across the USA performing Sonny songs. Here The Cynics video for "I Got You Babe."